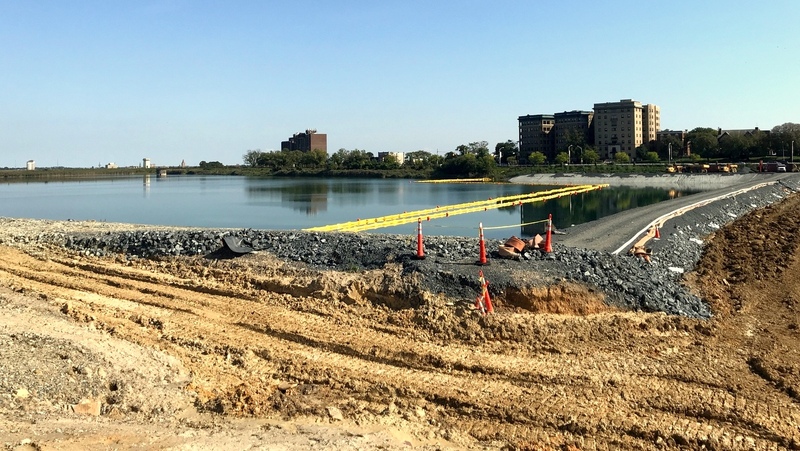 The fate of the drinking water reservoir that forms the centerpiece of Druid Hill Park – closed since January due to contamination from the city’s own construction work – remains up in the air. Turbidity in the reservoir is still nearly twice the state standard, according to the Maryland Department of the Environment. Last week, MDE placed tough new conditions on reopening the reservoir, a key part of a regional water system that not only serves Baltimore City, but hundreds of thousands of homes and businesses in Baltimore County and surrounding jurisdictions. 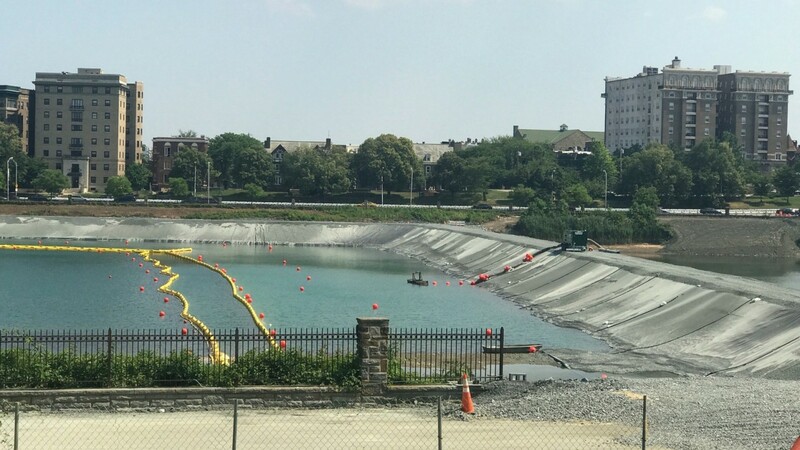 MDE’s compliance office called on Baltimore’s Department of Public Works to conduct additional tests to ensure that pollutants are not entering the reservoir from a cofferdam and construction vehicles at the site. “Daily heavy construction traffic in and around the lake presents the risk of fuel from the construction vehicles getting into lake water,” Zoë Goodson wrote, calling for the testing of volatile organic compounds (VOCs) as well as for benzene, toluene, ethylbenzene, algae and cyanotoxins in the water. DPW spokesman Jeffrey Raymond said such testing will not pose “a barrier or a burden” to reactivating the reservoir, which he said could take place at the end of October. The agency has promised that the reservoir would reopen ever since July when The Brew disclosed that its water had been isolated due to recurrent contamination. The lake typically supplies 30 to 40 million gallons of drinking water a day to area customers, according to published data. The tougher requirements from MDE are the latest twist in the city’s $134 million effort to build underground tanks at the western end of the lake to contain the reservoir’s drinking water. Underlying the current dispute between the two agencies are widely different interpretations of the quality of water in the existing reservoir. According to MDE, the amount of “turbidity,” or suspended solids in water, remains high, which carries the risk that water-borne e-coli, cryptosporidium and other parasites and viruses can get into the region’s drinking supply. Such contaminants are known to cause gastrointestinal and respiratory illnesses in humans drinking the water, including nausea, diarrhea, headaches and sometimes a persistent cough. 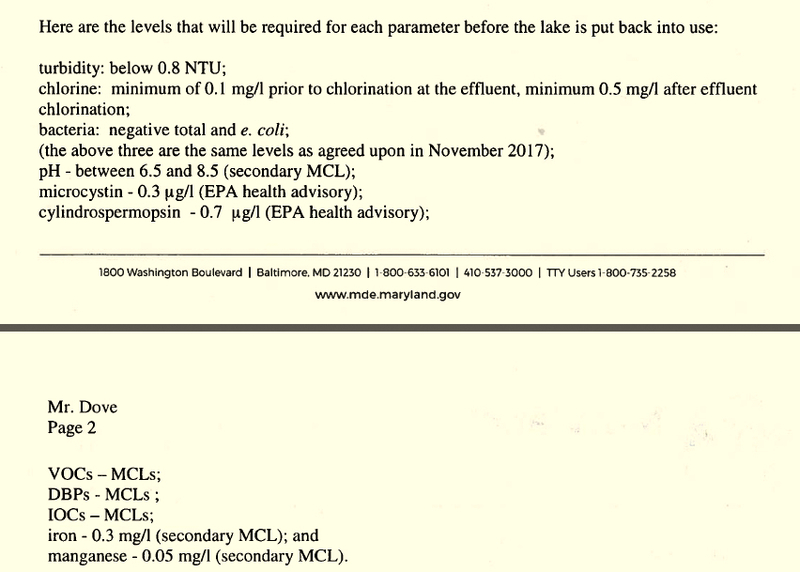 As of September 25, turbidity levels in Druid Lake ranged from 1.39 to 1.70 NTU (Nephelometric Turbidity Units) with an average of 1.51 NTU, according to MDE spokesman Jay Apperson. The average was twice MDE’s standard of under 0.8 NTU – and five times above the preferred limit of 0.3 NTU. Most strikingly, the latest readings were higher than the 0.9 NTU levels recorded last January when the reservoir was shut down as a safety measure. MDE says turbidity levels are higher now than when the reservoir was placed “off-line” last January. DPW says Druid Lake is getting cleaner. By contrast, DPW says turbidity readings are generally getting better. He attributed the lower readings to the recent adding of 200 million gallons of clean water to bring the lake to its full elevation. MDE has administrative responsibility for the Druid Lake project under an agreement with the U.S. Environment Protection Agency (EPA). Goodwin and other state engineers toured the construction site on August 10. The tour followed an unannounced MDE inspection on July 17 that found chlorinated water being dumped from the lake into the Jones Falls. Such dumping had been going on for probably nine months, according to the inspectors, and was the result of poorly supervised de-chlorination protocols by the contractor, Oscar Renda, and inadequate inspections by DPW. MDE has the power to assess substantial fines for such violations of state water permits, but has not taken any action so far.